The number of mumps cases at Temple University rose again this week. We have the latest details on the outbreak. A mumps outbreak at Temple University has now reached 67 cases — adding 13 cases in the past day. There are 12 confirmed cases and 55 probable cases — a jump from 28 infections last week. Health officials recommend anyone showing symptoms of the infection seek medical care and avoid contact with others for at least five days. Philadelphia health officials believe 13 additional people have contracted the mumps at Temple University sending the new tally from the outbreak to a new high. The total number of cases now stands at 67, James Garrow, spokesman for the Philadelphia Department of Health, said Tuesday. A day before there were 54 cases. Health officials confirmed 12 cases through laboratory testing while 55 others were listed as probable. The university has more than 40,000 students enrolled and 4,500 staff members, according to school data. Probable diagnoses are used in cases where a person in the community experiencing the outbreak shows mumps-like symptoms. Garrow said since the viral infection can't be cured, there's no reason to spend money to carry out confirmatory testing. Mumps can be easily spread among people in close quarters through kissing, the sharing of cups and fluids or competing in sports, according to the Centers for Disease Control and Prevention. Symptoms include fever, headache, muscle aches, tiredness, and loss of appetite. Swelling in a person's salivary glands causes puffy cheeks, a signature feature of the disease. 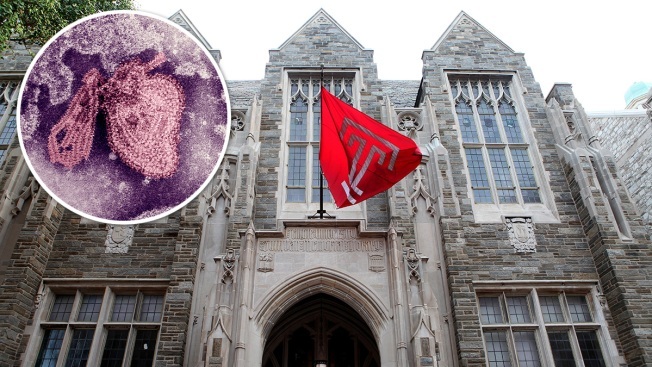 The outbreak prompted Temple University to change its immunization policy for incoming students by requiring them to have received two doses of the MMR (measles, mumps and rubella) vaccine before entering school. The vaccine decreases your risk of contracting the virus by about 88 percent, the CDC said. The vaccine's effectiveness can wane over time, however, meaning a booster shot may be necessary to keep up the body's defenses against the virus. City health officials previously said that may be why the number of cases is blooming. Health officials recommend students who may be infected limit contact with others for at least five days and seek medical care.